Another beautiful afternoon in Tokyo, Japan today saw us travel across town to the Ritz-Carlton Hotel for the UFC 144: Edgar v Henderson final pre-fight presser. If you’ve been following my blog for a while, I’m sure you know that press conferences in general aren’t the most captivating events to cover. Today’s presser in particular was rather long, in part because the same questions were asked 3-4 times each by various different media. The turnout today was rather impressive, with the usual group of North American media and a whole slew of Japanese media members. The top three fights were featured on the dais, and the entire cast of Japanese fights were in attendance for one-on-one interview opportunities. Below is a selection of images from the day. Check out the full take on UFC.com and Getty Images. My long day is finally over and it had the perfect ending – a great dinner with my lovely wife and photographer/friend Nick Laham. I was at Mandalay Bay early this morning to begin setting up a remote camera for the fights tomorrow. That all went pretty smooth, and hopefully there will be some good moments to capture. After we finished that up, it was about time to start getting ready for the weigh in. The arena, and especially the smaller-than-usual media section, started filling up earlier than normal. As a result, I was trapped in my seat for much longer than I’d care to be so as to insure I would not loose it. UFC Welterweight Champion Georges St-Pierre was the special guest for today’s UFC Fight Club Q&A session. He revealed that he expects to be back training in fight mode by July and should probably be ready to fight the winner of Diaz vs Condit in the fall. Georges was not at all secretive about his desire for Nick Diaz to defeat Carlos Condit so that he will finally be able to fight Diaz. St-Pierre also stated that he thinks Nick Diaz has some mental problems, but was quick to add that he himself also has his own demons which nobody sees. All-in-all, it was a good Q&A session with the champ. As the weigh ins approached, my buddy Rod Mar showed up and took a seat next to me. It’s always nice passing the time by talking shop with fellow photographers and friends. The hour was eclipsed in no time and the weigh ins began. No great surprises as everyone made weight. Only Alex “Bruce Leroy” Caceres had to employee the use of the towel to reach his contracted weight. Mike Pierce took a shot across the bow of Josh Koscheck by donning a bleach blonde wig for his face off with Koscheck. The two had to be separated by UFC President Dana White. Expect some heavy leather to be thrown in this bout. Heavyweight Roy Nelson looked much slimmer as he tipped the scale at 246 pounds for his bout against Fabricio Werdum. That’s six pounds lighter than his last bout against Mirko Cro Cop and nearly 20 pounds down from his heaviest fighting weight inside the Octagon. 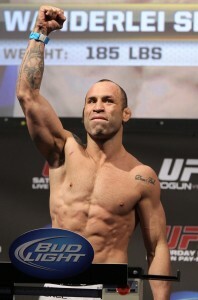 Werdum also weighed in at 246 pounds in his return to the Octagon after more than three years away. And in the main event, both Nick Diaz and Carlos Condit weighed in a pound under the limit for their Interim Welterweight Championship bout, capping off what should be a great night of fights. One things is for sure, this bout promises to be non-stop excitement. Both fighters are known for their fan-friendly fighting styles and willingness to try to finish the fight, not just score points. Below is a gallery of shots from this afternoon’s weigh in event. As always, be sure to check them out at Getty Images and UFC.com, as well. Another frigid day here in Chicago. Today saw us driving a few short blocks to the W Hotel on Adams for the UFC on FOX final pre-fight press conference. Everything was pretty much as expected, except for the extremely low light conditions of the ballroom. I’m not really sure why it was so much lower than normal, but it definitely made for a more challenging shoot. 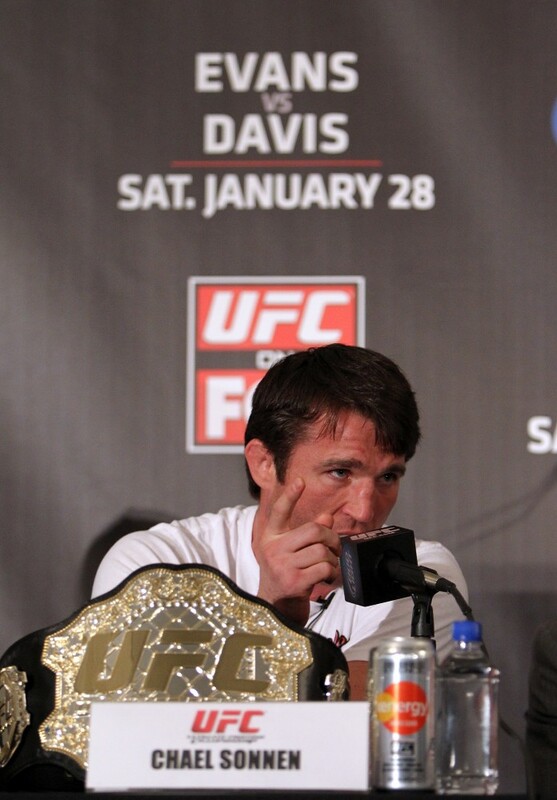 It came as no surprise to anyone in the room when Chael Sonnen walked on stage with a UFC belt and proclaimed himself to be the undefeated, undisputed Middleweight Champion. Though, interesting enough, he was seated next to Demian Maia, who did in fact defeat Sonnen by submission in the not so distant past. Nonetheless, Sonnen’s bantering was quite humerous. Main event opponents Rashad Evans and Phil Davis got into a verbal sparring match when Davis was asked about whether or not he would defeat Rashad in a wrestling match. As Davis was giving his answer stating of course that he would, Evans interrupted taking jabs at the former national champ. Evans repeatedly said that Davis’ technique was “trash” and he could not compete on an international stage. Other than Rashad’s poor taste comments at the first press conference in reference to the Penn State scandal, there hasn’t been a lot of trash talk between these two. Today saw that change. I think it helped generate a little more interest in that fight, which up until now has been overshadowed by the co-main event featuring Chael Sonnen versus Michael Bisping. Tomorrow is the official weigh in, which of course, I will also be covering. For now, check out the gallery of shots below from today’s presser. they are also available at Getty Images and UFC.com. 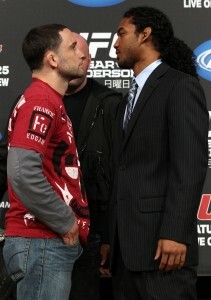 I just wanted to quickly share my UFC 140 images before I head over to the arena for the fights tonight. Nothing too major transpired at the weigh-in, other than Dennis Hallman coming in 2 1/2 pounds over weight. Dana White didn’t seem too happy about that. I guess for most, the other highlight of the event would be the return of Octagon Girl Brittney Palmer. As always, this is just a small selection. The full take is available on Getty Images. 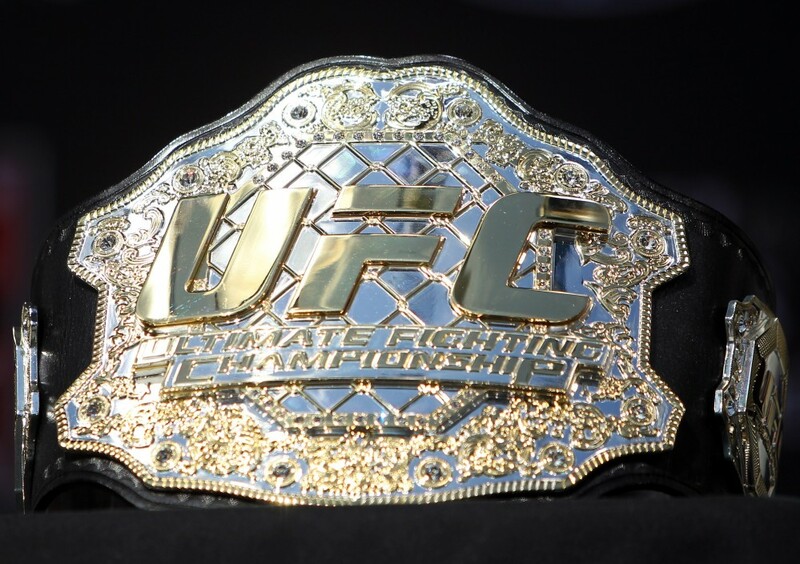 Today, all the fighters on the UFC 139 card weighed in at the HP Pavilion to make their fights official for tomorrow night. Before the official weigh-in, as is customary, UFC hosted a Fight Club exclusive Q&A session with welterweight fighter Josh Koscheck. Though Josh was a bit subdued, he still managed to raise a couple stirs from the crowd. He mentioned that he has considered changing his name to “Boo Koscheck” so that when he enters the arena, people Boo’ing will be cheering for him. He also expressed his sadness for friend and teammate Cain Velasquez after his loss last weekend to Junior dos Santos, but mentioned that Cain was back in the gym again Monday morning after the loss. Finally, in answer to a common question Koscheck always receives, he said that he would rather move up to 185 pounds or stop fighting completely instead of facing teammate and fellow 170 pound contender Jon Fitch. As the weigh-in began, there appeared to be issues with the scale, or perhaps the operator, as several fighters missed weight. It began with Shamar Bailey who came in 2 pounds over and was noticeably upset about it. Next, Nick Pace weighed in well over the limit, but his overage was apparently known about ahead of time and he came in 5 pounds over the limit. His opponent, Miguel Angel Torres, also mixed weight. Torres was also noticeably upset and turned to UFC President Dana White to say something. After that, the rest of the guys on the card made weight without (much) event. Dana had to separate Rick Story and opponent Martin Kampmann after Story got in Kampmann’s face and Kampmann, in turn, pushed him away. In other news, I received a call last night that I had been bumped up to first shooter for the event due to an unfortunate scheduling conflict. Though I never wish for someone else not to be able to do the job, I’m quite happy and excited to back on the box for a big show again. And of all the shows we have lined up, this is probably the best option as far as excitement. So, I will do everyone proud and make the most of my opportunity. I’m really looking forward to it. Here are some of the weigh-in selects. Check out UFC.com and Getty Images for the full take. I’ve been away for a few days, so I apologize for the lack of posts. This is the first of three for tonight that will get you caught up on my work from last week. UFC fans got their first public glimpse of Alistair Overeem at the UFC 141 announcement presser that took place in liu of the normal Q&A session at the UFC on FOX weigh-in last Friday in Santa Monica, California. We drove over to the Staples Center today to cover the UFC on Fox final pre-fight press conference for UFC and Getty Images. The event was held outside at the Verizon Plaza, just across the street from the staples center. It was a beautiful day outside and the stage was actually facing towards the sun this time, allowing for a much more favorable light than the last outdoor event (UFC 137 presser). The stage was also elevated considerably, which was both good and bad. Good because it allowed me to wander a bit without having to worry about getting in the shot of video cameras behind me. Bad because the angle was horrible from a seated position in front. I’m not at all happy with the face off shots, but it’s nothing I could control. The only way to get tight shots was to be up close, and the only way to be up close was from the low position. You can see the back lights in all the shots. Wish they’d mounted them 3-4 feet higher, or perhaps just not used them at all. The definitely weren’t needed. Anyways, here’s a selection of shots from the day. Full take, as always, available at UFC.com and Getty Images. 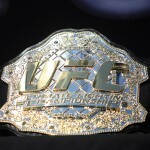 Today, all the fighters from the UFC 138 card weighed in at the Community Hall in Birmingham, England. All fighters, save Thiago Alves, made weight on their first try. Alves initially came in a pound over the 171 pound welterweight limit, but later made weight to make his bout against Sweden’s Papy Abedi official. After his initial weigh-in Alves and Abedi had a heated face-off, needing to eventually be separated by UFC President Dana White. 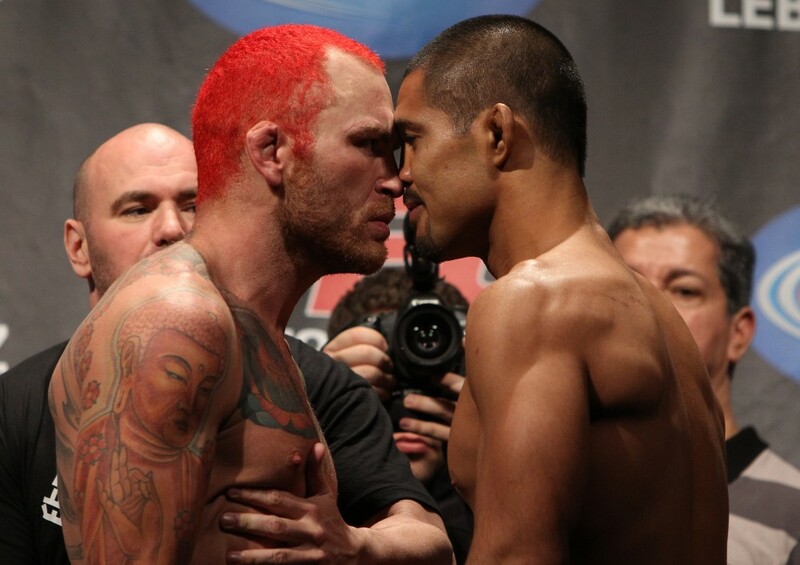 Not to be upstaged, middleweight main event fighters Chris Leben and Mark Munoz also got up close and personal during their face off.